So a while back, Cisco, VMWare and EMC announced that they are forming a partnership to co-operatively sell and support products. This joint venture has been named Acadia and is made up of a specifically screened and selected people and engineers from each company. What is particularly notable is that EMC and Cisco have committed in excess of $200 million to make it work. This tells me that they are serious about this project (always a source of concern). Then they added some of their best sales people to the mix including engineers and then went knocking on the doors of every large company in the world in a “No large customer left untouched” blitzkrieg of one on one sales and marketing. I doubt there is a CIO of global and most of the large companies who hasn’t had at least one presentation from the VCE people. So What is VCE made of ? Why are the Vblocks so Large ? 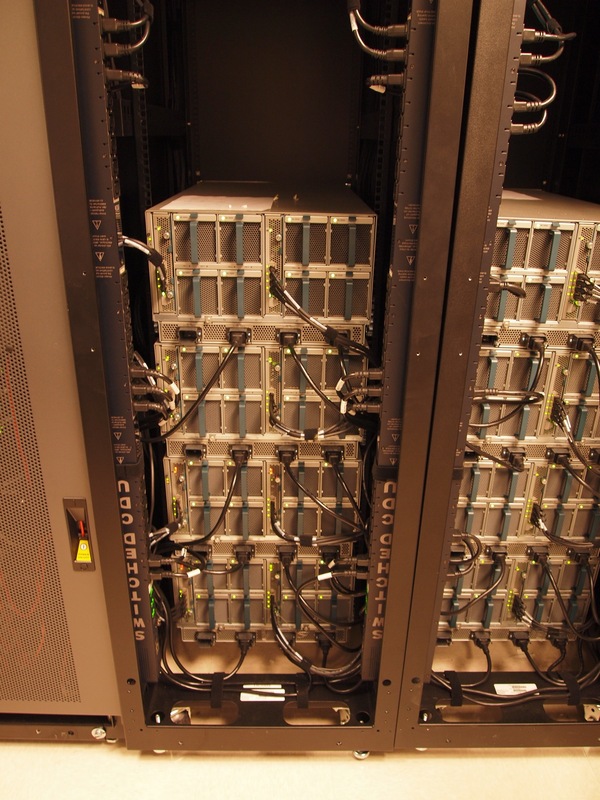 What happens if you exceed the operational parameters of a Vblock ? Because there was much discussion about why the Vblock that have some strict limitations, I wanted to look into why these limitations exist and why people would object so vehemently to them. And also talk around the question for why Vblocks are big. Too big for most people to buy. Comprehending the Limits on the joint venture. Acadia is not a merger (yet) of EMC and Cisco, but a partnership focused on the Data Centre services. The VCE partnership only promotes selected product groups from each company and even specific products within those group. For example, a Vblock does not include a Nexus 7000 switch, only the Nexus 5000 / 6000 / 2000 as the edge switches. 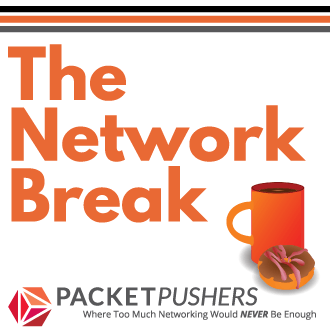 ( You would use your own backbone to connect to your Ethernet network and legacy FibreChannel network ). 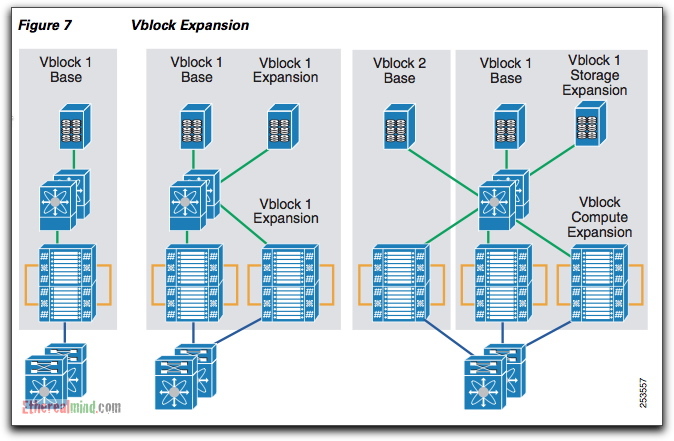 EMC offers CLARiiON in Vblock1, and Symmetrix in Vblock2. The partnership only extends to the contents of the Vblock racks. These limits may mean that your choices are restricted. Some people regard this as as major concern. I regard this as a reasonable trade off – good service, easy marketing against lack of choice and flexibility. It’s worth remembering that the joint venture is not exclusive. Both EMC and Cisco are free to pursue partnerships with other companies, and both are actively seen partnering in the market with other companies. Thus recent Cisco / NetApp and EMC/IBM announcements could create a confusing picture for some people who don’t understand these dynamics. That said, from what I’ve seen the VCE partnership seems to be a “big deal” for both sides with a lot of passion, commitment and, most importantly, significant amounts of cash that fund expensive marketing campaigns. In this case, marketing that seems to actually be relevant and useful. 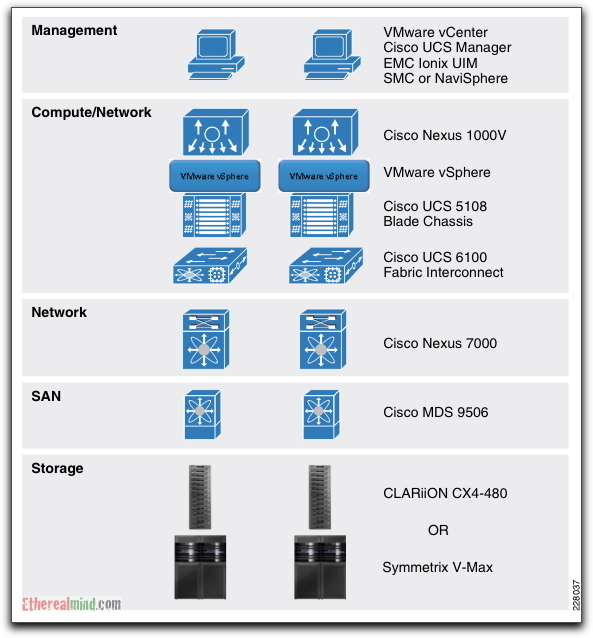 VCE only works with selected products from both Cisco, EMC and VMWare. That is, they only offers products from the Data Centre Business Unit from Cisco, selected products Centerra and Celera at EMC and VMWare vSphere. The product is positioned in the market as a private cloud so any technology not relevant to that message isn’t going to be considered eg. 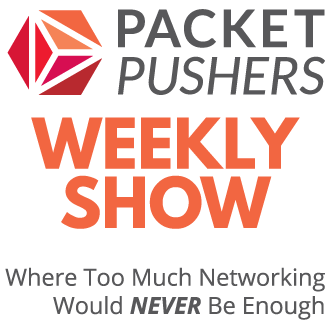 No firewalls, no edge routers, no wireless, no backup software, no deduplication,. Market clarity – limiting the product set allows VCE to have a highly targeted product message, especially with the “cloud” buzzword attached. customer want guarantees that it will work which should get better sales results. Acadia has to deliver the solution and deliver the support promise. Not easy when so many technologies are involved, with so many competing interests from resellers, customers and the vendors. I particularly want to focus on the Technical Capacity and Customer Guarantees elements of the argument. If you figure that EMC, Cisco and VMware are bringing a group of vendor engineers together, think about the problems you might have: engineers may have little or no expertise outside of their own company or worked in a cross-functional team. To overcome these problems I would go for a narrow product selection and then expand it over time. Remember that large companies create significant opportunities for ineptitude and incapacity. Layers of management can create indirection and misalignment just as easily as they can create opportunity and focus. Bringing together teams from three large companies could easily go wrong (case study – HP and it’s many divisions that are rarely coherent). There are other topics such as upsetting the resellers, market clarity etc are all pretty obvious and shouldn’t need discussion. The Vblock components are the cumulative permissions of what the marketing and business limitations will allow. There are no technical limits to what equipment could be in a Vblock except for the ability of Acadia to provide a good level of support. These limits are somewhat onerous but not entirely unreasonable. There are currently two Vblocks defined (and more are planned) – known as Vblock 1 and Vblock Two, they are designed, tested and (as is the fashion) certified to within certain, rigidly defined performance levels. The Vblock architecture is reduced to five layers of physical infrastructure and roughly shown in this diagram taken from “Vblock Infrastructure Packages Reference Architecture” released in 2010. A Vblock consists of a minimum and maximum amount of components that offer balanced I/O, bandwidth, and storage capacity relative to the compute and storage arrays offered. Each Vblock is a fully redundant autonomous system that has 1+1 or N+1 redundancy enabled by default. In practice, Vblock 1 storage is scaled to deliver from ~42 TB/41000 IOPS (Min) to ~68 TB/ 50000 IOPS (Max). Vblock 2 storage is scaled to deliver from ~140 TB/92000 IOPS (Min) to ~211 TB/140000 IOPS (Max). The hardware is selected to match your performance requirements. For Vblock 1, there are no hard disks on the B-200 series blades as all boot services and storage are provided by the SAN. Hawever a snall hard drive may be installed if local page memory is required for vSphere. For Vblock 2, each B-200 series blade module has 72GB SATA drive for page memory purposes. If required, these can be removed to reduce power and cooling overhead, increase MTBF or save costs. For Vblock 1, there are no hard disks on the B-200 series blades as all boot services and storage are provided by the SAN. Hawever a snall hard drive may be installed if local page memory is required for vSphere. If the local disk is user for main storage or operating system storage, it is not considered a Vblock and is a custom implementation at this point. The Limits are arbitrary, practical and mainly marketing. At the Boston Tech Field Day, we saw a number of questions on why there are limits, and what happens if you exceed the solution parameters. I believe it is a simple marketing reason – simple products, simple factors, easy to comprehend makes for a product that is easy for sales to sell, and even easier for customers to buy. Pricing is clear and unambiguous, and sales peoples will attempt to focus the customers away from price onto other topics. Like low power, special UCS features, ease of operation, etc etc. The key factor is that the Cisco UCS server will be perceived by many as unproven. You can be sure that HP / IBM / Dell are going to work that Fear / Uncertainty / Doubt in a competitive situation. If you choose to exceed the offered the solution, then that is a simple choice. It’s not something to be particularly concerned about. Currently, we all build stacks of servers, storage and networks and provide our own support. Why would buying a guaranteed stack make any difference ? These limits are to ensure that service guarantees can be met. The service guarantee exists to help customer to buy these products., it does not exist to make the products work. However, when the CIO is about to approve a purchase order for half million pounds they will be looking for a comfort level that it’s going to work. Those Cisco UCS servers are new and you want some assurance. So once the system is working, feel free to head out in your own direction. Meeting the requirements of your business is more important that having a an end-to-end guarantee in overall picture. Remember, Cisco / EMC / VMware is still going to support each product using the same process that we have today. My concern with the Vblock bundle is fear of lock in. 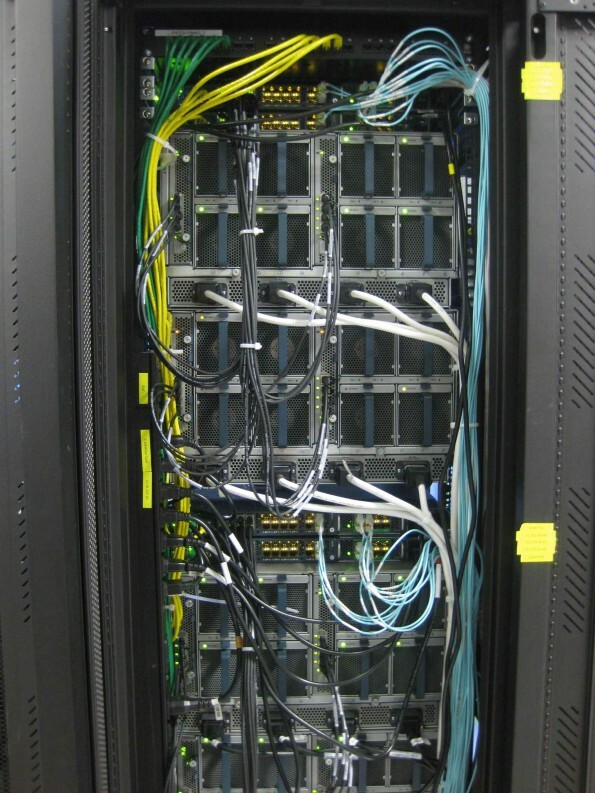 The Cisco UCS product is a closed solution within the racks. Across the backbone of the Data Centre will also be Cisco Nexus 7000 switches for “best compatibility”. All server components must be purchased from Cisco who will be able to arbitrarily set the price. All and any server upgrades, and extra server must come from Cisco. All storage vendors are an effective lock in today. The so-called “certification programs” ensure that EMC and other “chosen few” are restricted to the supply of drives and accessories. If Cisco / EMC achieves a dominant position then they have the ability to control pricing. Since both companies are already dominant in their respective markets, and tend to “reassuringly expensive” price models, this is a well founded concern. Customers should be worried about pricing from these vendors. Loyalty usually means extra profits for the vendor, and costs for the customer. What does a Vblock physically look like ? This is a front view of the Vblock 1 with storage, servers and switches. And this is the rear view. Notice how few cables are used for physical connections here. A Vblock 2 is quite a bit larger and needs more storage. The server blades are larger (more CPU, more RAM per blade). I believe that the increased IOPS for the storage subsystem means that bigger storage units are needed. I think five racks is at the smaller side of the Vblock 2 possibilities. This cabling could support up to 6000 servers.....not much is it ? As Vblocks are added, the capacity of the Vblock scales either as an aggregated pool, whereby any ICS blade can access any storage disks n the SAN or as an isolated silo. For example, it is perfectly acceptable to aggragte to Vblock 1’s to provide capacity for 6000 VMs that can share common storage capacity… As long as storage capacity is added in conjunction with compute capacity to maintain balanced performance as published within the Vblock, the system does not require any additional validation . Heh, you bet they want to sell you lots more so of course there is an answer for this. Once you have made the first purchase, you are likely to come back for more. Lets make it easy for the customer to do that. So, Why are vBlocks so Large ? A Vblock 1 is expected to support from 800 to 3000 VMs, and a VBlock 2 is expected to support 3000 to 6000 virtual machines. Since I started writing this post, a Vblock 0 has been announced that supports 300 to 800 VMs. You might think that 800 is a lot of VMs. You might think that the price of a Vblock is too much. In which case, you aren’t someone who is going to buy it. If you can’t scratch together the several hundred thousand in single purchase order, you do’t understand the question. Today, many companies buy infrastructure as part of the project. If a project needs a server and a switch then that is funded. If a project needs a data centre, then a data centre is built. 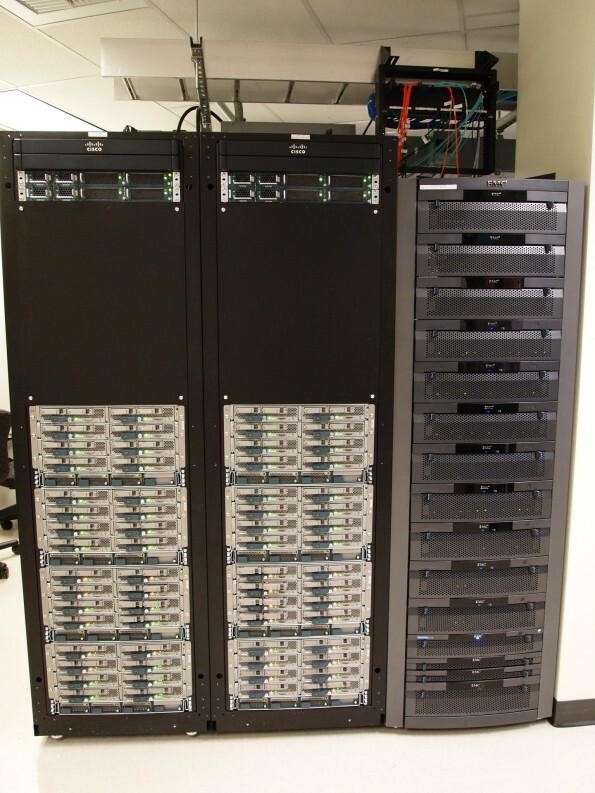 If a project needs fifty servers, then they MIGHT consider using VMware. Mostly we wait a few years and then have a big project to clear up the mess created by project funding of infrastructure. Cisco and EMC don’t want to sell this product to small business. Cisco in particular wants to establish themselves in the marketplace as quickly as possible. Therefore selling to big companies, who are doing the “big cleanup project”, who are taking the time to evaluate the whole cost of ownership cycle, implementing with a full cycle approach is what Cisco wants. This is important. Why ? Because Cisco wants to be able to produce white papers claiming the “huge cost reductions”, and “radical operations alignment” and “enabling technologies” etc etc. These white papers have real impact on the analysts and customers who figure that if they buy the product they will get those benefits. All these great stories, so loved by ‘journalists’ convince the middle sized market to buy Cisco servers. What does EMC get ? 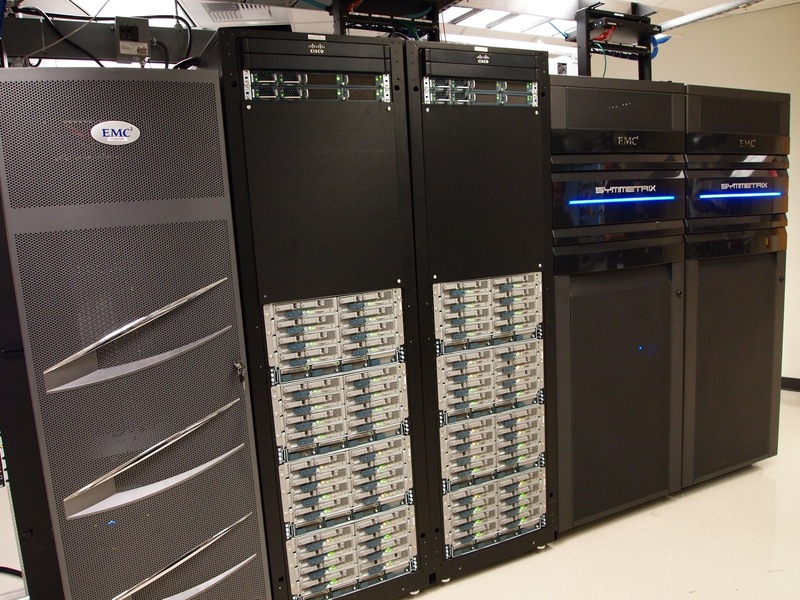 EMC gets to move into the mid-sized market right alongside Cisco. EMC has been targeting the high end of the market, and they need new markets. A move down into the mid-sized market must not damage the high end products and branding (since this could affect profits), and attaching to a “differentiated” product will keep the premium marketing message intact. Basically, I view the VCE partnership as an upmarket fancy marketing campaign with extensive tie-ins and Acadia as the insurance policy against direct selling FUD from HP& IBM. It’s “dressed up with a little black dress and killer set of heels” and well funded to boot. This type of thing normally makes me distrustful as many of these initiatives have turned out to be one night stands with an uncomfortable and unhappy morning after. On the other hand, both Cisco and EMC have attached their corporate goodwill to this program in a major way. If Acadia fails, both companies will suffer significant image loss. It’s not marriage, but they are definitely living together. One of the most exciting (to my mind) aspects of the Vblock concept, is the potential to change the purchasing cycle of IT Projects. Many companies fund new purchases from projects only. This tends to create an inherently failed infrastructure buildout where each project buys what it needs. Project “cost controls” mean that infrastructure is rarely purchased to outside the project requirements. That is, buying additional disk drives or edge switches is easy, but buying additional arrays or core switches is almost impossible. A Vblock could represent a “once a year” purchase of server infrastructure. Much easier than endlessly integrating, and reintegrating a hodge podge of servers, memory, disk drives and accessories into some sort of complete system. Compare this with the HP C-Class chassis concept which requires endless upgrades to scale into new and more useful configurations. Ultimately I remain convinced that Cisco must and will buy EMC to compete with HP and IBM. The Acadia joint venture looks a lot like a trial or temporary position while the market reaction is gauged. EMC has a marcap of USD$34 billion and revenue of USD$14 billion while Cisco has marcap of USD$154 billion on revenue of USD$35.5 billing. Cisco appears capable of acquiring EMC and is believed to have sufficient cash reserves to make a substantial cash rich offer. EMC probably has pretentions to be a lot bigger and don’t want to be bought right now. EMC egos are well known for their ‘capacity’ and they work hard at that. Combine that with a Wall Street that is anti-acquisition at the moment, and Cisco can’t make a move right now. Public Clouds are fine for people that are not conducting serious business today. Dot Com startups, marketing pushes, publicity campaigns and other low vitality requirements could be considered for cloud infrastructure due to their trivial nature, but serious business applications are unlikely to move into the cloud with the current level of capability. However, private clouds are practical today. To me, Vblock looks like an early mover in the Private Cloud space for IaaS. The option for a corporate IT department to build a three rack system that hosts between 300 to 700 servers is an exciting development. If I can reduce the amount of time my operations teams spend doing trivial and repetitive tasks and move them into systems automation on the management platforms, then we are moving to better place. There are no technology issues in this stack. In general, people perceive that Cisco and EMC are market leaders in their respective spaces, and the corporately the two companies fit well together. Unlike other stacks, there doesn’t appear to be a product that is less than excellent. In this sense, few people will dismiss the Acadia solution on technology grounds. Convincing IT Management to take on the change put forward by Cisco / EMC is going to require a lot of marketing and sales. And that’s exactly what Acadia is all about. The technology takes care of itself here, Acadia is just marketing exercise, but a good one. Well researched post as always. I am not sure I agree with all your points, but I believe @bgracely is working on something, so I’ll defer on a broader response. I do, however, want to touch on the idea of vendor lock-in–you kinda lost me there. Everything in a vBlock is available unbundled so there is no restriction to the access of the individual technologies. vBlock is also standards compliant within the vBlock so there is no secret-sauce protocol we use to do stuff that a customer cannot do for themselves. Externally, the vBlock connects to the rest of the data through standard interfaces, so if you buy one vBlock, there is nothing that technology-wise that forces you to have to buy a second or third vBlock. You also heard form Chuck Hollis, while in Boston, that there is no price premium for a vBlock vs. unbundled components. That last part may be the deal of the century–essentially, you are getting Cisco and EMC to do you systems integration, testing and validation for free. So where is the lock-in? The fuel for the fire in Boston was the same thing you bring up: surety vs control. Different customers will find different balance points and handle different applications differently–you might want a high level of control of the infrastructure that underpins your back office systems, but be perfectly happy to put sharepoint, exchange and VDI on a vBlock. The point is customers control when/where/how they make use of vBlocks. But customers who have purchased the integrated vision will be fearful of making other choices. Or develop strategies that remove careful and intelligent evaluation, and “just buy what’s on the list”. That’s a kind of lock in that is very real. If we lose the skills to integrate multiple vendors, will we end up with the mainframe / minicomputer days ? I fear so. Cisco wants to take Data Centers to the same world of LAN/WAN where there is no evaluation anymore, almost everyone just buys Cisco. Great post from a technical perspective although I can’t say I agree with the subjective conclusions you come to. One important note to your update about Acadia being a servies only company, that’s no longer true. Acadia is now a qualified reseller of vBlocks and the subcomponents. They’ve also brought on an aggressive CEO with lofty revenue goals. Be interesting to watch how it all plays out from here. You’ll get over it. Plus, the fact that Cisco and VMWare has made their own reseller tells you volumes about the state of the reseller industry. The push into stacks means that the vendors intend to take all the revenue and profits, the resellers will be left with low value SME customers. On the other hand, the whole stack thing is only temporary. Another year or two and clouds will be over and the technology will trickle down in usable form. I’m not bothered. It looks like there are 4X 6120 interconnects in the pictures, why not 2 6140s?